Vice president for microlending at Finanta Bank, Kersy Azocar (seated in black sweater, left), serves as the moderator for one of the nine roundtables at the Hispanic Chamber of Commerce session. 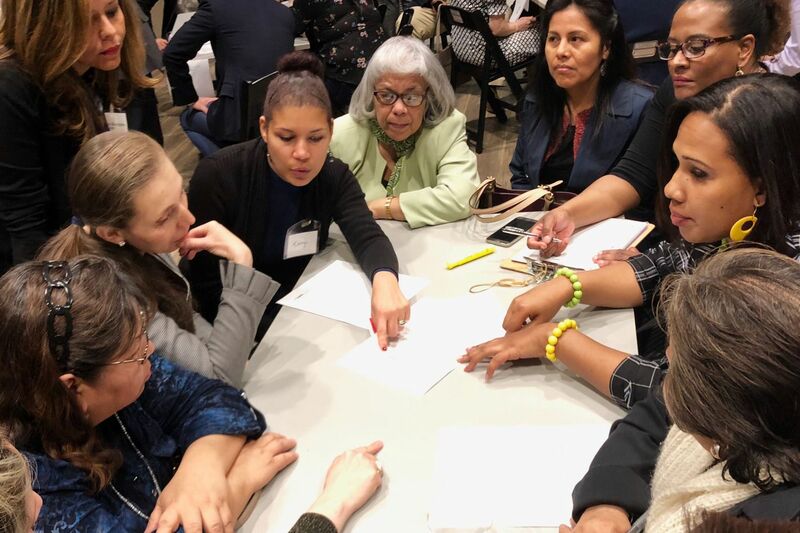 In its first ever “one-on-one” public session, the Greater Philadelphia Hispanic Chamber of Commerce heard directly from more than 80 Latino entrepreneurs and business representatives Wednesday at its 29th annual members meeting. The idea for the session was two-fold: Community members typically don’t fill out chamber membership surveys, and the region’s Latino population has evolved drastically since the 1990s. “The city is changing rapidly, so we feel that this is the time to look and really understand — get in very closely — who is our community of entrepreneurs and what exactly are their challenges,” Jennifer Rodríguez, the chamber’s CEO and president, said at the meeting at Taller Puertorriqueño. During the meeting, participants were divided into groups to discuss a variety of topics, including the cost of doing business, the lack of access to capital, and finding opportunities and resources that support Latino start-ups. Rodríguez said there are about 11,000 Latino businesses in Philadelphia in service and professional sectors such as hospitality, accounting, law, architecture, engineering, and banking. She’s witnessed a growing presence of Colombian and Venezuelan start-ups, adding to the robust business community created by Dominican and Mexican communities. Develop subsidized internships and fellowship programs that create jobs and professional development opportunities for people of color. Organize the bundling of health-care benefit packages for businesses with fewer than 10 employees. Offer one-on-one coaching to help start-ups grow from solo entrepreneurs to employers (who can actually take a family vacation). Create of a guide or directory listing Latino businesses and professionals in the region. Pioneer a mentoring program, allowing business owners to be matched with other like-minded entrepreneurs dealing with similar issues in similar industries. Yohani Moya, 39, a construction engineer at Lintels Design and Build, and a Philadelphia Community College graduate, said he wishes he could offer more paid internship opportunities for professional Latinos entering the market. “Most of the times, you need to work for a well-known company to have the chance to really make your mark and get a career going, but how can Latino professionals get there if they don’t have the financial resources to take on an unpaid internship?" said Moya the fourth generation in his family in the construction industry. The findings will be presented at the State of Hispanic Business report in October, and help build the chamber’s 2019-2020 Latino Small Business Agenda.